Coursera offers online courses taught from over 60 universities for free. I recently learned of one offered by Berlkee College of Music an Introduction to Jazz Improvisation, taught by one of the greatest improvisers ever, vibraphonist Gary Burton. All you need to take this course is a basic understanding of chord symbols and improvising over basic progressions (blues, etc. ), have an intermediate ability on your instrument, and have the ability to record yourself and convert the audio to MP3 format. The next 5 week session starts up next Monday (April 29, 2013). If you want to participate in this one you’ll need to sign up soon. 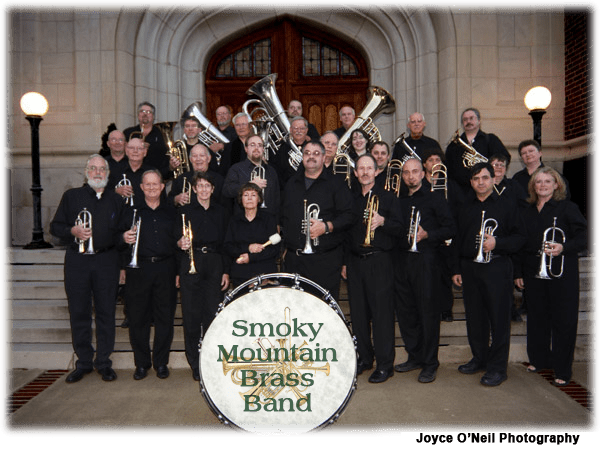 This Sunday (April 28, 2013) the Smoky Mountain Brass Band will be performing a concert at Groce United Methodist Church in Asheville, NC. The concert is free, but we will be collecting a good will offering that will be split between a charity for the church and to help pay for the band’s expenses for the season. It starts at 3:00 PM. I’ve programmed a variety of music for this concert, so there should be a little bit for everyone. There are a couple of pieces by James Curnow, Brass Metamorphosis and Concertpiece for Cornet (which will feature Asheville High School math teacher, Bill Ross, on the solo – he sounds great on this). There are a couple of march transcriptions. Many will recognize Colonel Bogey March from the film Bridge on the River Kwai. One of our cornet players, Peter Voisin, arranged a couple of pieces for the group, Bring Him Home from Les Misérables and Sleep, a really beautiful piece by Eric Whitacre (see embedded video below for Whitacre’s virtual choir performance of it). If your in western North Carolina this Sunday please come hear our performance and be sure to say hello. Tomorrow, April 22, 2013, composer, arranger, and music educator Robert W. Smith will be visiting the School of Music at Western Carolina University and give some guest lectures. In addition to speaking at a couple of classes he’ll be giving a master class on music education technology called “Applications for a More Successful and Productive Classroom.” He will be giving this talk from 1:30-2:30 in the recital hall in Coulter on campus. While he may be best known for his work at writing music for drum corps in the 1980s, Smith is a very prolific composer who has written and arranged over 600 works. I recently conducted Movement Three: “The Ascension,” from his Divine Comedy, Symphony #1. He has some really neat pieces available and I’m looking forward to the opportunity to meet him and pick his brain some about composing and arranging, as well as hearing what he has to say about the applications of music technology in the classroom. If you’re near WCU tomorrow try to get out and participate. Mars Hill College’s Music Department will be hosting their annual New Music Festival this weekend, April 19 and 20. The featured composer this year is Bryan Hooten, who is not only a composer but also a trombonist. Friday afternoon the MHC faculty will be performing music by Elliott Carter and in the evening there is an “Interactive Improvisation Hang Out” with Hooten. I’m particularly excited about Saturday evening’s concert because the MHC Jazz Ensemble will be playing a new piece I wrote for them, called Haywood Bluff, in addition to 3 charts by Hooten. I got to hear some of this music last weekend when they opened up the Asheville Jazz Orchestra’s show. Since their student pianist wasn’t able to make this performance I even sat in on piano. They sounded great on my tune and on the one chart by Hooten I played with them. There’s more than just the Jazz Ensemble on Saturday night’s program, so there should be a little bit for everyone. I plan on attending the concert Saturday night, so if you’re around western North Carolina this weekend looking for some music to hear stop on by and if you see me, be sure to say hello. A recent forum discussion has gotten me thinking again about the practice some private brass teachers have of deflecting student questions about embouchure. In some cases I think this is unintentional and unconscious. It’s easy to be dismissive of something that you don’t have a good handle on and if you don’t think something is important in your own playing you’re likely to not consider it important for your students. I think this is particularly tricky the more accomplished a performer the teacher is. It’s hard to remember that effortless playing was the result of a particular process and not the method itself. Great musicians often have trouble taking a step back and helping struggling students when they don’t remember (or never knew) what it was like to have difficulty. More interesting to me is the practice of intentionally deflecting a student’s questions because you don’t think offering an honest answer is going to be helpful. The example from the forum discussion was that one participant felt that informing a student that it the embouchure muscles must work harder to play higher would encourage unnecessary tension. I think answering this one question hinders more players than could be helped because telling them it is OK to tense up isn’t serving them well as a teacher. I often answer most of a post a[nd] not 1 question because I don’t think it is in their best interest to answer it. This does seem to be a fairly common practice from what I’ve seen in a lot of brass master classes and texts. A good teacher needs to set priorities for students and help focus their work in an order that is going to provide both immediate and longer term benefits. For example, fixing a brass student’s breathing can make improvements in their playing quickly and then set them up for work on more difficult challenges later. But this isn’t really the sort of non-answer that I’m curious about. When a student asks a direct question is it really a positive to fend off their inquiry or is it better to answer it directly and then move on as needed? Of course there are situational factors that need to be considered, but I think we need to think about why a student would ask a question in the first place. While I’m sure that some students pester a teacher with questions for attention, most students ask questions because they are confused or curious. If the student is confused about a concept, I feel it’s best for the teacher to answer the question clearly. If my answer is going to confuse the student even more then it’s my responsibility to find a different way of explaining the concept. Sometimes this involves taking a couple of steps back and laying a foundation so the student can scaffold the more difficult to understand concept. This can take time, perhaps more time than is allowed in a particular lesson or class, but in the long term I think it’s best to address it eventually. Most of the time I think we can offer a simplified answer and explain why we’re glossing over it for later. [Q]uestioning involves speculating about possibilities both real and unreal, given and hypothetical. To question is an immensely creative act because questioning requires that an object be not just as it is. If every object were just as it is, then questions would serve no purpose, for the only answer we could give would be to point at the object and say, “But here is your answer.” On the contrary, questions are designed to probe, to find something that is not already there, to discover relationships and possibilities that are not given. Curiously, I’ve found it difficult to find much academic research or pedagogical discussions on deflecting a student’s question. It’s almost as if this practice is unique to music instructors, but teachers of other subjects almost universally want to answer student questions and encourage them. It’s time for another “Guess the Embouchure Type.” This time I’m going to take a look at trumpet player Wild Bill Davis Davidson and trombonist Ashley Alexander and see if I can guess which embouchure type they have. Take a look at the below video and see what you think. My guess after the break. If you don’t live in the U.S. you might not understand “March Madness,” which is just wrapping up here. March is the month when the NCAA basketball tournament kicks into high gear and college teams compete to see who ends up on top. While the teams travel around the country to play (and are excused from classes for a university sponsored event), they take their “spirit squads,” which usually include the school’s pep band. The way pep bands are run differ from school to school. When I was an undergraduate the pep band was a class, we received (small) class credit for it and earned a grade at the end of the semester. If I remember correctly it was required for us to play in for at least one year as a music major, but since I enjoyed it I played almost all of the four years I spent at Illinois Wesleyan University. While a graduate student at DePaul University I occasionally subbed in the pep band for basketball games. Students who played in the pep band didn’t earn credit but received a small stipend to play and support the basketball team. When I subbed in the student I played for paid me directly for filling in. These days I think the stipend is more the norm, as it is a huge demand on the students’ time, with games happening almost every weekend (sometimes more) and frequently requiring travel time. With the NCAA tournament going on, the pep bands travel with the basketball teams and like the basketball players, the students miss out on classes. An anonymous pep band member recently wrote an article on Deadspin about his experiences playing at the tournament, frequently for other schools that don’t happen to have a pep band to play for their team’s games. What’s a typical week for a spirit squadder? If the team is placed far enough from home, we get to fly with them. If the team stays close by, which happens only to top seeds in the first round, we’ll bus in on game day. That hasn’t been my experience, though. The round of 64 is played on Thursday and Friday. Let’s say Texas is playing at the Staples Center on Thursday; the Longhorns need to adjust to the new time zone, get in some practice, and make appearances for alumni and donors in the area. So they leave on Tuesday, which means that a saxophonist in the band gets a night out after he checks in to his hotel, then Wednesday is all his. If Texas wins on Thursday, he has the rest of the day and Friday to himself before the round of 32 game on Saturday. If Texas wins on Saturday, guess what? He’s got another free trip in store. The band members get to miss a lot of class, and I imagine most of them aren’t spending their free time studying or practicing. When we first check into our hotel we get three days’ per diem up front, usually around $55 total, which doesn’t seem like a lot until you realize that, for a college kid, “per diem” is Latin for “beer money.” If we win our first game, we get per diem for the remainder of the weekend when we return to the hotel. 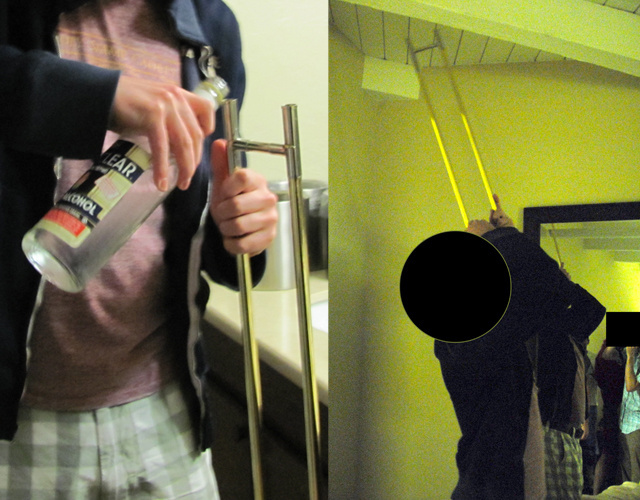 A $5 tax on all 29 people in the band makes for a nice slush fund for filling a hotel suite with booze. We never finished that Everclear. Every year we end up dumping liquor down the drain. Last year it was the moonshine I don’t remember drinking. While I never attended an NCAA tournament or traveled as a pep band member, in my experience the picture our anonymous author paints about what goes on during his experience away from school during the tourney is typical. I wonder if this is really what our music schools should be doing with their time and resources. Of course, these bands are more and more often supported by the school’s athletic programs rather than the music programs, which is a whole other can of worms.